The are referred to as the "ankle joint" is made up of the spaces between the bones in the shin (tibia and fibula) and that of the rearfoot (talus and calcaneus). These joints are connected by ligaments and other structures to provide stability during movement and weight bearing. When a sudden twist or movement occurs the ligaments can tear or stretch leading to ankle sprain. The most frequent direction of injury is when the foot rolls or is inverted so that it twists inwards. In these injuries the structures on the outside of the ankle are affected. Ankle sprains are common in sports such as basketball and netball where a player might land on another players foot and with field sports such as soccer and oztag where there may be uneven ground. It is also common in everyday life such as when walking on uneven footopaths or if you land awkwardly when stepping off a curb. What should you do straight after a sprain? 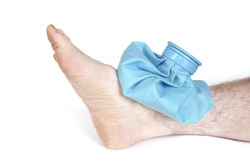 If you have sprained your ankle the first thing to do is to stop what activity you are doing, elevate the ankle higher than your heart level and start cold therapy. If you don't have an ice pack then a bag of frozen peas or ice cubes wrapped in a cloth will work. If you don't have any compressive bandages to wrap it in then keep your socks and shoes on until you find something. These steps will reduce the amount of swelling and you should continue the same approach over the next 2 to 3 days. A therapists will diagnose you with a grade of ankle sprain depending on its severity. Grade 1 sprains will normally recover well and indicate only stretching of ligaments and usually only one ligament. A recovery time of 2 to 4 weeks can be expected. Grade 2 sprains involve more than one ligament and some excessive stretching or partial rupture may have occurred. This will be associated with a significant reaction and may take 4 to 6 weeks to recover. Grade 3 sprains involve a full rupture and often additional damage such as fracture and other nearby ligaments. These will take more than 6 weeks and depending on the severity up to 12 weeks to recover. Why isn't your ankle sprain improving? Regardless of the severity of the sprain and even if other injury has occurred the initial pattern in the first 3-4 days will be quite similar. Pain and swelling may increase the day after and weight bearing may be difficult. Most simple ankle sprains will then start to improve. the amount of swelling, movement of the ankle and pain with standing and walking will improve significantly over the first 1 to 2 weeks and full function and return to sport taking around 4 to 6 weeks. A fracture of the bones in the ankle..
Displacement of the bones near the ankle. Strain or tear of the nearby muscles (peroneal and tibialis groups). Cartilage damage of the ankle joint occurred. A high ankle sprain may also have occurred between the tibia and fibula. In a lot of cases there may not be any additional damage rather the ankle is healing slowly. This can occur if you have had several previous ankle sprains, there are some existing degenerative joint changes, the ligament damage was significant or if there are secondary biomechanical issues that affect your weight bearing. Your therapist can assess and provide a structured plan to address these. What other treatment do I need? Exercises for balance/proprioception using wobble boards and trampolines. Trigger point therapy for muscle activity and tightness. Dry needling to improve healing and muscle tightness. Kinesiotaping to assist with drainage of swelling and also muscle activity. Taping to protect against re-injury when returning to sport or work. Your therapist can teach you how you can do this for yourself. 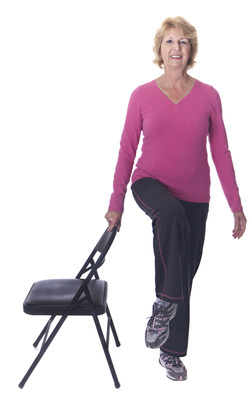 Strengthening of the muscles around the ankle. Agility training to regain function. Sports specific exercises to return to your pre-injury performance. Incomplete rehabilitation following an ankle injury increases the chances of future re-injury and can affect the function and performance of your ankle even after the pain has subsided. It is important to understand the severity of your injury and to undergo complete rehabilitation for even the most basic sprains.